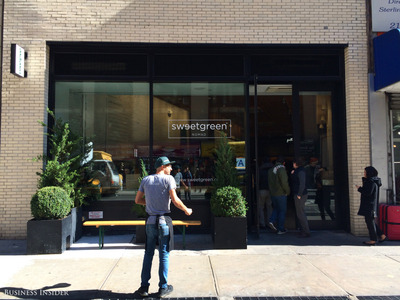 Hollis JohnsonSweetgreen is known for drawing long lines. Sweetgreen has raised $US200 million in a new round of funding led by Fidelity Investments, the chain announced Tuesday. The company is now valued at over $US1 billion. This round of funding will bring its total equity raised to approximately $US365 million. Sweetgreen, the fast-casual salad chain that’s known for its cult-like following and drawing long lines during lunchtime hours, is now valued at over $US1 billion. On Tuesday, the chain announced it had raised $US200 million in a round of funding led by Fidelity Investments, bringing its total funding to $US365 million. As the company is private, it does not report sales numbers. According to Crunchbase, it has received $US128.6 million in funding so far. According to Neman, the company’s online ordering revenue is increasing at a rate of 80% year over year. “By the end of 2018, we will have over 1 million people on our digital platform, and over 50 per cent of orders will be processed through our app or online platforms,” he told Bloomberg in March.